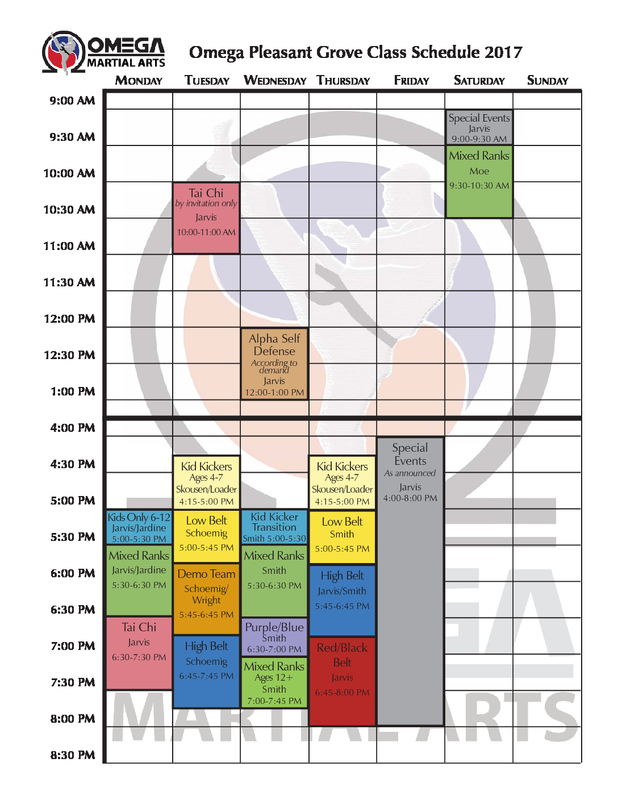 Whether you are looking for youth classes or adult classes, our students progress through a curriculum designed to advance them through the Omega belt system that is appropriate for their age group. Our aim is to foster an environment where students develop lasting relationships while learning to develop focus, discipline, self-control, coordination and balance through teamwork, personal fitness and respectful communication. The Omega Martial Arts journey is an exciting and challenging one. With enough hard work and perseverance, it will lead to Black Belt and beyond! With the recent opening of our dedicated school in Pleasant Grove across the street from Macey’s, we are able to offer more class options than before though classes are still being held at the Pleasant Grove Recreation Center. To register for classes, please call 801-822-4837. We hope to be able to offer even more classes as attendance grows, so please tell your friends! Below is the class schedule that we hold at our school in Pleasant Grove, located across the street from Maceys. We also have some additional classes on MONDAYS at the Pleasant Grove Recreation Center.